Display 4 digit LED, 0.6"
Panel Cutout 1/4 DIN, 3.622" x 3.622"
The CN600 Series temperature monitor is a temperature indicator with either high or low alarms. 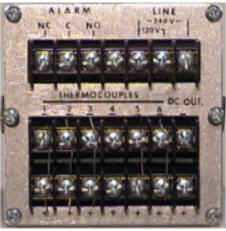 The six input channels accept independent thermocouple inputs, and there is an individual setpoint for each channel. In operation, the CN600 will scan each channel for 4-12 seconds (adjustable on the side of the unit), and the display will indicate the temperature measured by the individual thermocouples. A red LED indicates an alarm condition; in the event of an alarm, scanning is halted and the relay de-energizes, until the manual reset button is depressed. 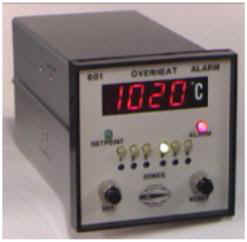 The CN601 models are high temperature alarms. The CN602 models are low alarm models. The CN602 models also feature a built-in cold start alarm supression. When the "START UP" LED is lit, the alarm action is suspended until the temperatures of each input reach their respective setpoints. Power failures for less than 30 minutes do not affect the start-up operation.